And I can garantee you, none of them work any more in macOS Sierra, they used to in previous versions of the OS, but not anymore. You can do this by editing system .plist's through defaults (tedious), or you can use Onyx for this (simple). Onyx is quite a capable utility and it's free - if you like it, donate a bit for the Author though he does a great job with this app. 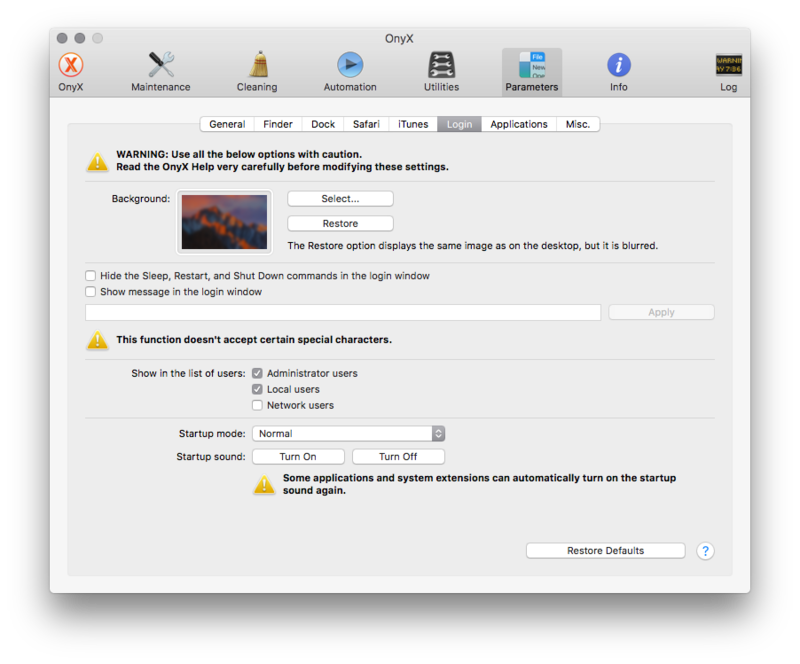 If you want to do this without any extra software, you would need to edit your defaults by importing/exporting them. I wrote a script for the exporting part, it writes each domain into a separate file for easier overview and keeps system namespace/user namespace separate + sorts out system/apple defaults from those that were changed/set by any software the user installed. I use it mostly for filtering crap leftovers from tests to keep the defaults tidy- since the background/login is also set there- that's what you need to edit. In some cases, you might need to parse binary .plist files, and this needs an editor that can parse those- easily done with TextMate (or Xcode if in need of "vanilla"). Hope that solves your problem. Not the answer you're looking for? Browse other questions tagged sierra login-screen . How do I change the login screen background in Lion? How do I download an older OSX / macos version from the mac app store?